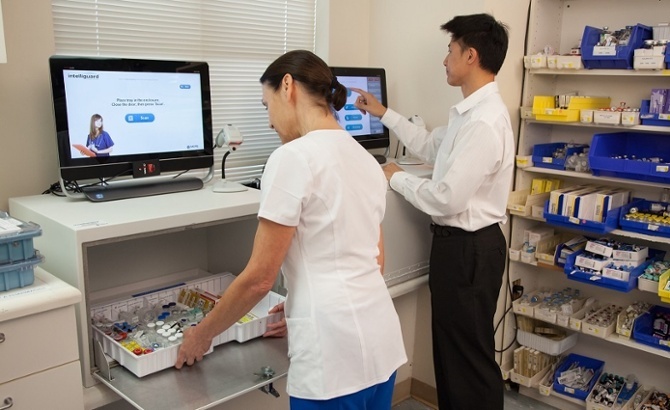 Hospital pharmacy automation projects often start with the primary goals of increasing patient safety and improving care. The benefits of error reduction and pharmacist time returned to focus on patient care activities have been well measured and documented. While those are key performance indicators when implementing radio frequency identification (RFID) in hospital pharmacies for medication inventory management, there are other important benefits to automation as well. These include improved staff satisfaction, morale and overall well-being. The “softer” benefits might sometimes be overlooked but pharmacist and pharmacy staff satisfaction is incredibly important, not the least of which because happier staff leads to happier and healthier patients. RFID automation is extremely effective in reducing manual workload and cutting time spent on repetitive tasks. Automating tasks such as manually counting the drug inventory of kits and trays doesn’t just improve accuracy and safety, it increases efficiency and saves time. In turn, reducing manual, repetitive workload increases morale by empowering pharmacy staff to spend more time doing what they love – taking care of patients. By using RFID healthcare technology for kit and tray replenishment, hospitals enable pharmacists and staff to spend more time focused on high value patient care tasks, which not only increases productivity, it enables staff to derive more satisfaction from their work. Due to the nature of their daily activities and the repetitive actions they undertake, pharmacists and pharmacy staff may experience chronic injuries, such as wrist pain or tendinitis. Chronic injuries result over time from repeated overuse. Intelliguard® RFID work stations can be easily customized allowing for proper ergonomic use and fitting specific space constraints. According to the Shelf Obsessed blog 6 Tips for Creating a Functional Pharmacy Workflow: “Creating a more functional pharmacy workflow should be an ongoing goal of pharmacy owners, managers, and pharmacists, as these efforts will lead to improved productivity, efficiency, and accuracy. Simple steps like pinpointing inefficiencies such as redundant or unnecessary movements and excessive bending and reaching can make a big difference over the long hours of a working day.” We couldn’t agree more! Contact us to learn more about hospital pharmacy RFID automation and how we can help you reduce errors, save time and make work safer and more enjoyable for you and your staff.